The Xevo TQ-GC is equipped with Quanpedia, a compound-centric GC EI MRM database that acts as a starting point to reduce method development time. Customized GC-MS/MS methods can be created or modified quickly as required without the need for manual input of MRM transitions, GC methods, or data processing methods. Quanpedia covers a wide range of key compounds of concern for food and environmental contaminant testing labs. By considerably simplifying GC-MS/MS analysis and having a compound centric database containing over 1000 compounds, lab productivity can be increased. 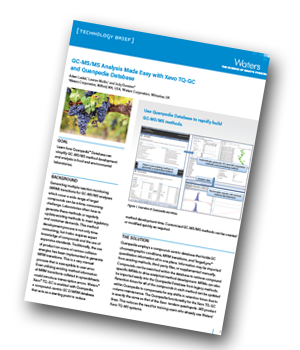 Quanpedia employs a compound-centric database that holds GC chromatographic conditions, MRM transitions, and TargetLynx quantitation information all in one place. Information may be imported from existing methods, third-party files, or supplemented manually. Compounds can be searched within the database to retrieve compound specific MRMs to drive analytical method development. MRMs can also be imported easily into the Quanpedia Database from legacy methods. Retention times for all the compounds in each method can be updated within Quanpedia to compensate for any shifts in retention times due to column maintenance The Quanpedia functionality for the Xevo TQ-GC is exactly the same as that of the Xevo tandem quadrupole-MS product lines. This reduces the need for training users who already use Waters' Xevo TQ-MS system.